Dr. Charles Tator was an avid hockey player in his youth, playing almost every day well into his 20s. In all of the hours he spend on the ice, he never suffered from a concussion. Tator, a professor of neurosurgery in Toronto and founder of ThinkFirst Canada, spoke to QMI Agency prior to presenting a concussion awareness workshop recently. Though Tator said Hockey Canada has already “taken a lot of steps to change the culture of the game,” he believes more should be done. “I would prefer body-checking be eliminated until the age of 16,” he said. 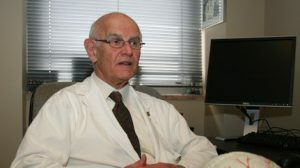 An expert in both concussions and brain injuries, Tator said recognizing the signs and symptoms of a concussion is key to understanding and treating the blow to the head — an injury that cannot be seen on routine X-rays and scans. Symptoms can include headaches, dizziness, nausea, memory loss and sensitivity to both light and noise. He said a person with a concussion needs immediate treatment. When you or a loved one has sustained a brain injury, you need to focus on healing. Let the experienced Graves Richard Harris LLP team look after the rest. Contact us to schedule a free one hour consultation.